Every year, the Las Vegas Convention Centre opens its doors to thousands of gadget fans, keen on getting up close and personal with upcoming technology. 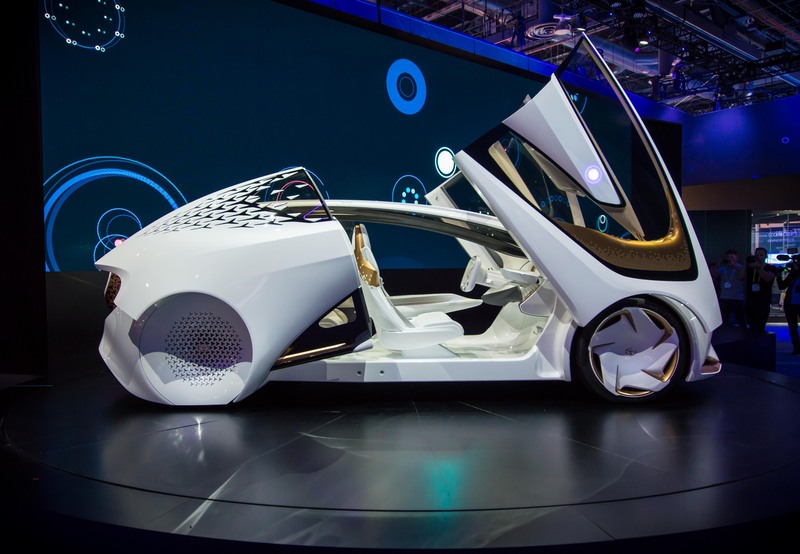 Recent years have seen an increasing presence from the automotive industry, with many manufacturers seeing it as the perfect platform to unveil futuristic concepts, launch the latest autonomous tech and highlight upcoming trends in infotainment and human machine interface. This year was dominated by the autonomous car – something the keen road-trippers among you may be slightly disappointed to hear – but it also looked much further ahead to a time when the car becomes a digital assistant, rather than mere transport. 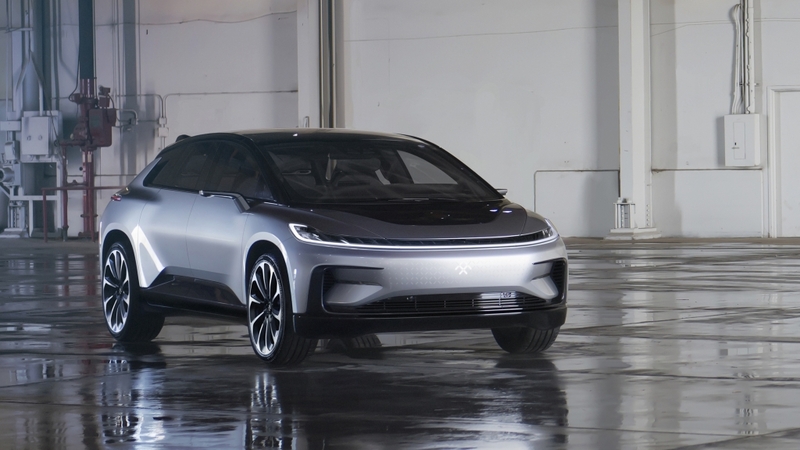 The Faraday Future FF91 was arguably the talk of the show and the Californian start-up overdelivered on last year’s promise of a production-ready electric vehicle to rival those offered by Tesla. It uses numerous powerful electric motors to propel it from 0-60mph in just 2.39-seconds. That will make it the (claimed) fastest accelerating electric car when it goes in sale in 2018, giving Elon Musk something to mull over, yet it manages 378-miles on a single charge, despite its motors delivering over 1050bhp at full power. Toyota’s beautiful Concept-i explored the themes of artificial intelligence and deep learning, with the shapely machine able to develop and adapt as it forms a relationship with its occupants. A CGI-heavy demonstration on the firm’s stand showed the vehicle ‘getting to know’ its new owner using natural language and advanced artificial intelligence, dubbed Yui, in order to form a bond. The slightly cheesy film then progressed through the family’s life, portraying moments when Yui suggested a visit to an ostrich farm based on a conversation in the car, recommended a perky playlist when it sensed the driver was feeling down and even praised the father on his excellent parenting skills. Toyota believes that as vehicle’s become highly automated, they will offer much more than just a means of transport, blurring the lines between our smartphones and laptops to create all-encompassing virtual assistants that will safely get us to our destinations and allow us to be more productive in the process. BMW looked inwards this year, pondering a futuristic car interior that does away with most buttons and dials in favour of holographic navigation, allowing the driver to flick between menus without having to touch anything. Gestures are picked up by ultra-sonic sensors and advanced cameras, while the system blasts air onto the hand in order to offer the haptic feedback required to confirm any hand movements. 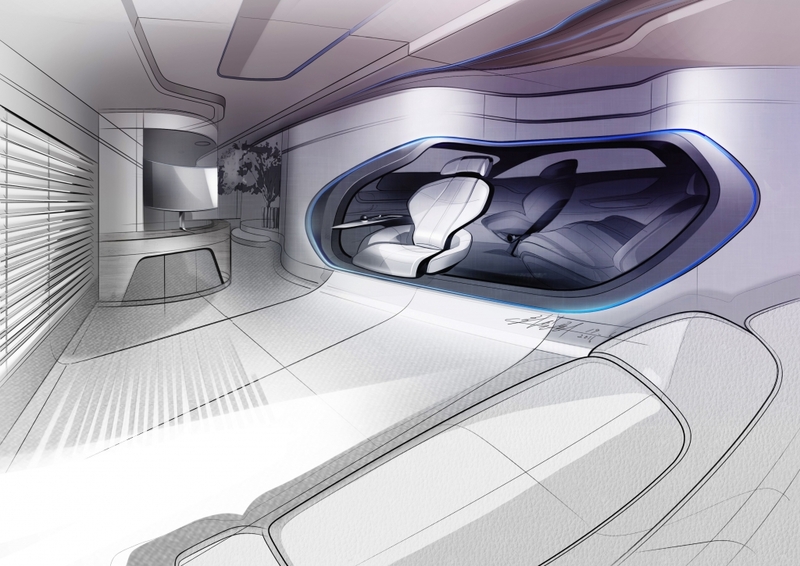 Seeing as holographic screens aren’t the most visually arresting things, BMW dressed it up inside the i Inside Future concept, which was more sculpture than a preview of cars to come. Complete with novels under the seats and faux shrubbery dotted around the cabin, it looked more like a Grand Designs entrant than something you’d want on your driveway. 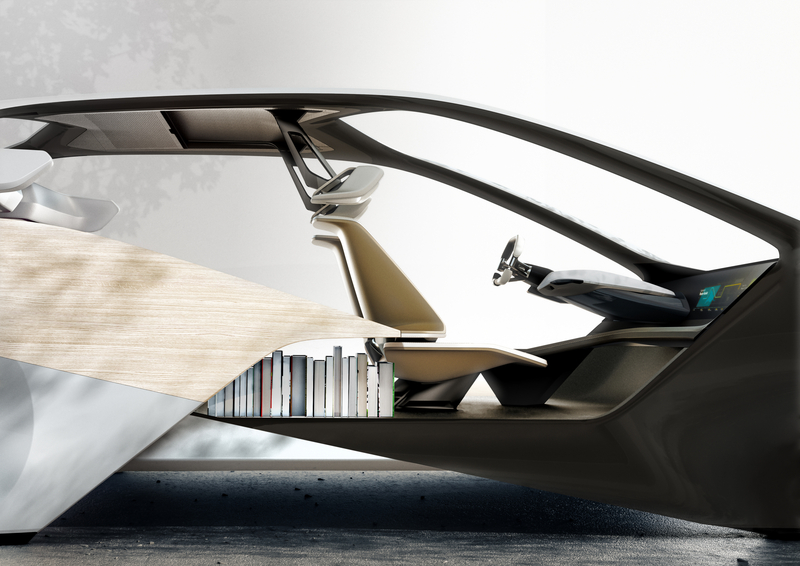 Hyundai’s automotive crystal ball was kicking out even weirder concepts, as its Mobility Vision concept centred on a Smart Home, complete with car that can morph from comfortable lounge space to equally comfortable autonomous transport. Clearly, it was wild blue-sky thinking (the logistics of hanging a car on the lounge wall do not bear thinking about) but the marque made slightly more sense with its Ioniq Electric Scooter concept. With the ability to be charged and stored in the front passenger door of its upcoming Ioniq electric hatchback model, the diminutive electric kick scooter tackles the ‘first and last mile mobility’ challenge, allowing users to get from the potentially inconvenient charging stations to their destination without breaking a sweat. Finally, Honda’s stand is worth mentioning for two reasons: firstly, its Riding Assist motorcycle could help those nervy bike riders gain confidence with the offer of greater stability at slower speeds. In short, the front forks feature advanced robotic technology that see the front suspension system physically lengthen and shorten, lowering or raising the bike, depending on speed. At lower speeds, the forks extend and the bike lowers, while hundreds of robotic micro adjustments essentially see the bike balance by itself, even when at a standstill. 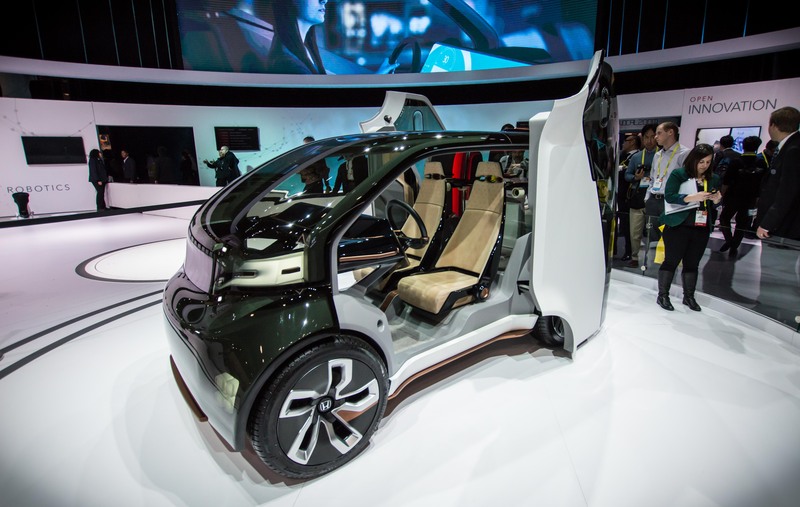 A second concept, dubbed NeuV (New Electric Urban Vehicle) was arguably the only car at the show to address the issue of car sharing, with a spokesperson claiming that cars are left parked and essentially useless a staggering 96 per cent of the time. To address this, Honda’s all-electric NeuV uses the power of autonomous technology to cleverly join a fleet of driverless taxis when it is not in use, making the owner some cash during downtime and reducing the amount of unused cars in the world. When the car isn’t giving Uber a run for its money, it is using the Honda Automated Network Assistant (HANA) AI system to learn everything about its driver: what route to work they prefer to take, times they require the car and even the ability to detect the emotional state of occupants. If the numerous presentations at CES are to be believed, most manufacturers are already looking well beyond the launch of fully autonomous mobility and it looks like our vehicles will soon become an extension of our smartphones and smart homes, learning what we like and making decisions based on advanced artificial intelligence. Slightly scary? Of course. But there’s no denying the car industry is currently going through one of the most exciting transition periods in living memory.